Heres a video my tuner put together for me. Nice numbers! What kind of fuel setup were you running with this? Very legit! What clutch are you running? I just noticed the dyno says 29.97. did you mistype or did u run 39psi if so 745 seems low compared to the 609 u made on 20psi. Fuel setup is dual walboros, -10 feed -6 return. Precision 95lb/hr primaries and 165lb/hr secondaries and e85. Clutch is a 350z specialty z clutch. 5 puck with d21 flywheel. The dyno only went up to 30psi but aem was showing 39ish. The reason the numbers are low was because we had to do 3rd gear pulls instead of 4th. We tried one pull at first in 4th and overloaded the dyno by mph. We did a back to back pull in 3rd and lost around 30hp just from switching gears. 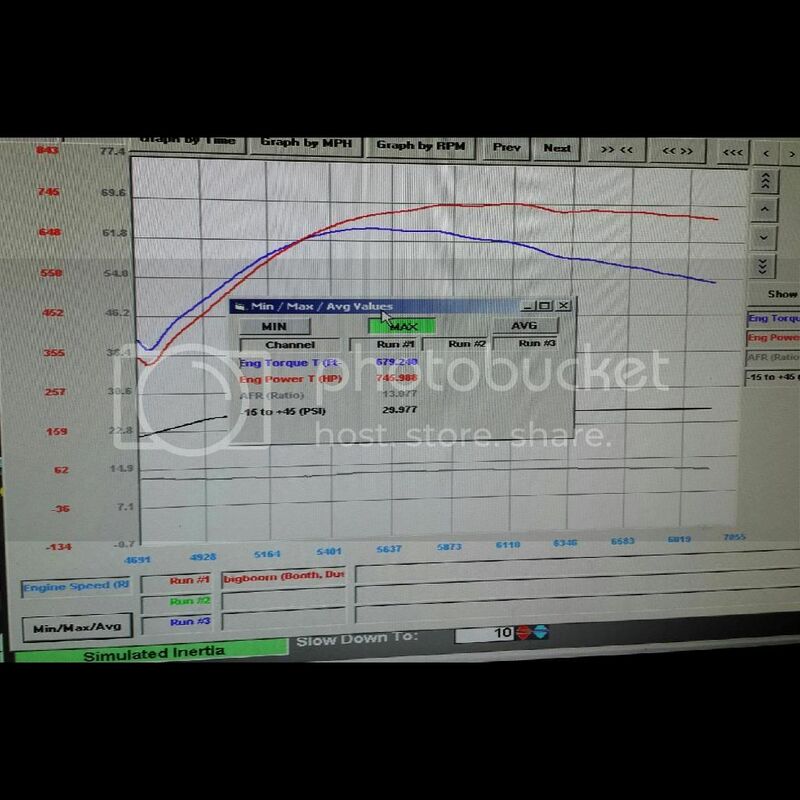 This was also on a mustang dyno that reads low compared to dyno jet which is what the 609hp was tested on. also if you can get a 4th gear pull somewhere with a bit of tweaking , i think you would have the first 700wtq ka. Better beat kedbmx to it he should do the same with his new 10.5:1 setup. Looking at the chart it seems like the HP peak is a little low in the RPM range. Do you think that's a result of the T3 exhaust housing? What cams are you running? The t3 def is restricting the power in the upper rpm range. It starts falling off at 6300 when it should keep climbing to 8k+. Still one of if not the best powerband I seen on the site. I shift at 7 n only made 630whp n ran 10.5 he should be deep in the 9s!! It peaks early due to the small housing. Builds boost quicker so hp comes on sooner. I run the bc 272s cams. Thanks rosadoracing! My goal is to just see a 9.99 sec pass. If i can get further that would be awesome.